Schleich - Healing Set Large. When a horse or a unicorn is injured, experienced elves can help them quickly because they know the healing properties of plants, and use them carefully to help the animals. From the plants, healing bandages are woven, which are placed around the animals' fetlocks. Sometimes the mysterious powers of healing crystals help, too. This way, the elves can help all animals to get well again. 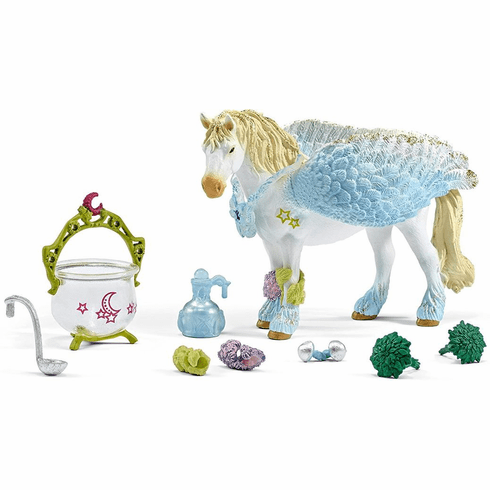 Help the elves to make the unicorn feel better soon! Pegasus measures approximately 5.5 inches long by 4 inches tall.